This is a joke. It's a comic and it's not actually my story, but it's partially based on someone else's story. 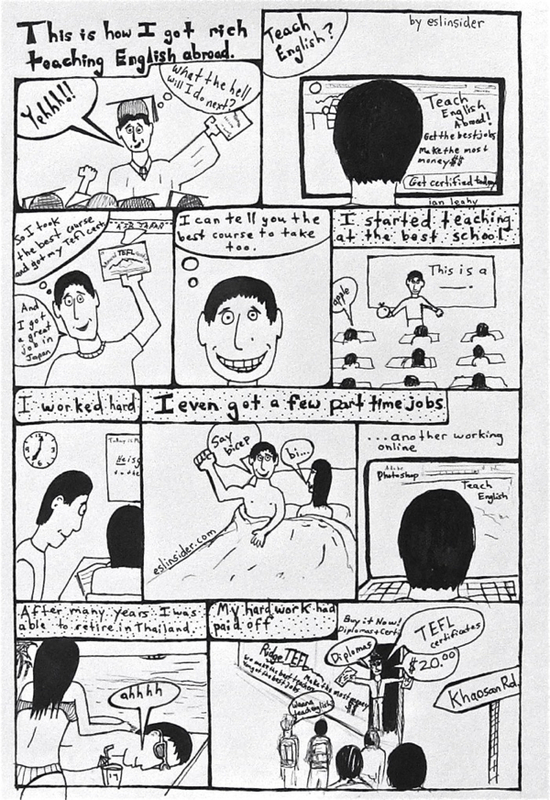 I took a trip once to Thailand for a vacation while I was teaching in Taiwan. I was staying in Bangkok on Khaosan Rd. which is a popular spot for tourists and it's also a little seedy. I remember a guy was there talking to his girlfriend about the fact that he needed a degree for his teaching job. He was looking for the place where they sold diplomas on the street. It was pretty funny actually and it turned out they not only sold diplomas, but TEFL/TESOL/CELTA certificates as well. So you can buy a fake TEFL certificate or even a fake degree there, but it comes with a risk and another cost. The risk is you could get caught and deported, have to a pay a fine or maybe something else. The cost is if you spend money on a TEFL certificate and don't actually learn anything then you'll pay the price when you get into the classroom. Not knowing how to teach and handle your students isn't going to be fun. I imagine that you can get the rest. But if you didn't catch it... haha, it's a joke, but did you know that they sell diplomas and TEFL/TESOL certificates on Khaosan Rd. in Bangkok? Just remember if you do this you'll pay the price later. Learn more about TEFL courses.